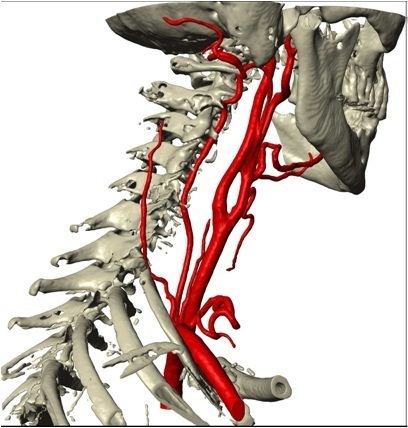 Human vasculature targeted by intra-arterial injection. A team led by Dr. Manosh Paul at the University of Glasgow used CFD to analyze a new intra-arterial method for injecting cancer medications. The intra-arterial method offers the benefits of targeting the medication on the cancerous regions rather than having it spread throughout the entire body thereby increasing efficacy and decreasing side effects. The CFD process begins with a CT scan of the patient to reveal the geometry of the arteries, bones, and tumor. The CFD simulation itself then takes into account the injection site, injection pressure, and pulse to simulate the eventual concentration of the medication around the tumor. This approach therefore can customize the delivery per patient. Speakers have been announced for next month’s FLOW-3D Users Conference in Munich. MSC Software has posted more information about their Aerospace Users Symposium to be held this September outside of Washington, DC. The abstract deadline for the Thermal and Fluids Analysis Workshop has been extended to 1 June. 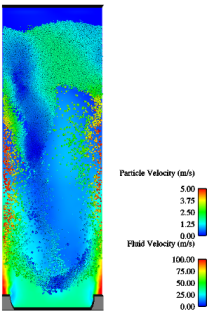 Coupled fluid-particle simulation of a fluidized bed. Image from DEM Solutions. DEM Solutions announced the release of the EDEM CFD Coupling Interface that lets any CFD solver be coupled with DEM’s EDEM solver for discrete element modeling. The bi-directional interface lets any CFD solver – in-house, commercial, or open source – perform a fully coupled fluid-particle simulation. This interface has been used since 2006 exclusively with the Fluent CFD solver and is now extended to any CFD solver. The interface’s API allows for interactions of mass, momentum and heat. Canyon’s new time trial bike, the Speedmax CF Evo, features fork, seat, and down tubes with non-NACA cross sections because CFD indicated a lack of good aero performance below 70 km/hr. Tecplot was named a finalist for Red Herring’s Top 100 America’s award. The award identifies the most promising private technology companies. The results of Intelligent Light‘s research into modeling helicopter rotor and wake interactions was featured in NCSA’s Access magazine. NASA announced the recipients of 2012 Space Technology Research Fellowship grants. Airbus Bremen is looking to hire a CFD Meshing Workstream Leader. CEI announced the discontinuation of their EnSight CFD Free and EnSight CFD Paid products and their replacement with EnSight Free and EnSight Desktop. The new products offer more capability, a smoother upgrade path, and the same pricing as the products they replace. Is This Really the Most Mesmerizing Fluid Dynamics Video You’ll Ever See? Gizmodo calls this video collection of various fluid phenomena the most mesmerizing that you’ll ever see. To me it looks like the backdrop from a Pink Floyd concert from 1967. What does it look like to you? This entry was posted in Applications, News and tagged CEI, DEM Solutions, EDEM, EnSight, FLOW-3D, Intelligent Light, MSC, TFAWS. Bookmark the permalink.